Having a smooth and beautiful skin is what many people have dreamt of, but the way to get it is the real problems. You probably need to go through a lot of treatments. One of them is what soap that you used daily. There are many different kinds of soaps out there, but not much that can be trusted fully as the market usually have many imposters or the soaps are not regulated yet. That’s why it is better for you to search for your soap from the dermatologist. The dermatologist will make the recommendation, and one of them are the Kojie San Skin Lightening Soap. Like its name, Kojie San will give you the maximum performance to lighten your dark spots due to the acne, age spots, freckles, sun damage, or any other skin pigmentation problems. So if you want to learn more about Kojie San Skin Lightening Soap, let’s see its explanation below. The Kojie San Skin can be used thrice every day; you only need to fit it with your usual bath schedule as the more you use it, the more it gives a result. Many people are thinking about this soap performance. After using it a couple of time, you can say that it is pretty decent. You can get the result in about six days. In six days you will be able to see the difference in your skin. The dark spots are starting to shrink and disappear whereas you get a better and smoother skin with it. However, you need to mind about its usage whereas you always need to apply SPF lotion after using Kojie San Skin Soap. The SPF will protect you from the sun, and you also need to get some moisturizer as the soap will make your skin dryer, and this moisturizer will help cover that. 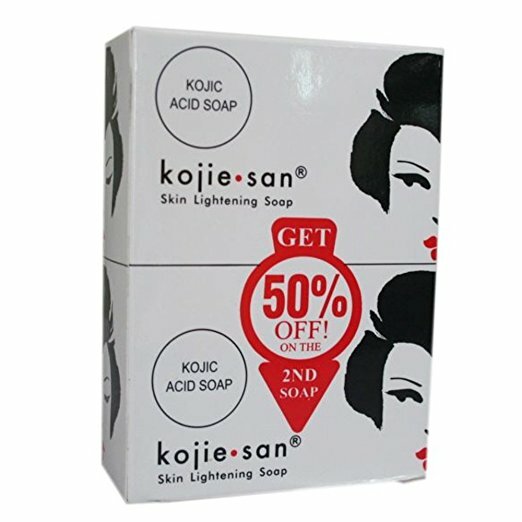 The Kojie San Skin is a regularly used soap which will give the lightening effect to your skin. It does work for the hyperpigmentation problem, and the result is quite promising. Other benefits of using the Kojie San is about its firming and tightening effect. It also cleans and removes the dead skin cells. The downside of Kojie San is the dryness of our skin will rise to the point where you need the moisturizers as the addition to this soap usage. You will also suffer some skin irritation or sun damage if you don’t use the lotion while going out. Other than that, you can get the stinging sensation and a skin breakout. These kinds of problems will increase your budget tremendously as you need to buy the lotion or the moisturizers. Aside from that, the price is balanced as Kojie San Skin is an inexpensive item. In overall, Kojie San Skin offers more problems rather than more benefits for its users. However, it has the great ability in curing the dark spot problems. All you need is to buy the other things like the lotion and moisturizers. After buying those, Kojie San Skin will show you how great its performance is. Ingredients: Pure Kojic Acid, VCO, Sweet Orange, Vegetable Extracts, Glycerine, Vitamin C.
Check the best price for Kojie San Skin Lightening Soap here!